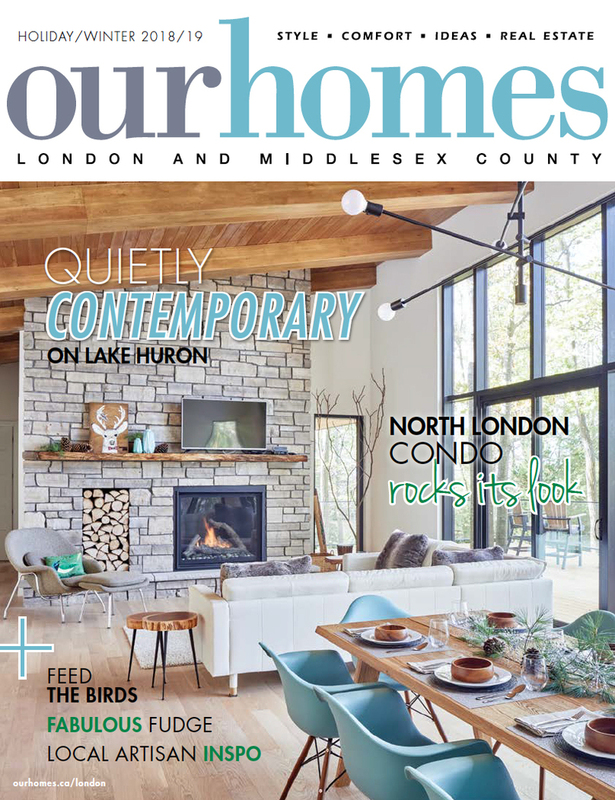 A version of this article originally appeared in the Holiday/Winter 2018/19 issue of OUR HOMES London and Middlesex County, p.20. Find local businesses in our London directory. Jim and Jason enjoyed cottaging near Grand Bend, but they yearned for a place with waterfront access. 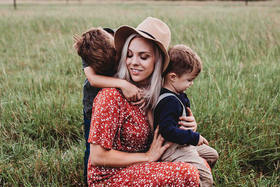 They finally found a property two years ago, and enlisted The Barnswallow Company to help them achieve their vision: a quietly contemporary vacation home with as little visual separation from the outdoors as possible. 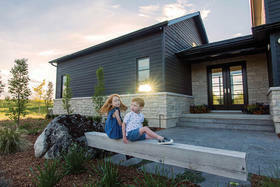 Inspired by mid-century and industrial influences as well as wood, stone and steel building materials, their new cottage is simple yet also dramatic. 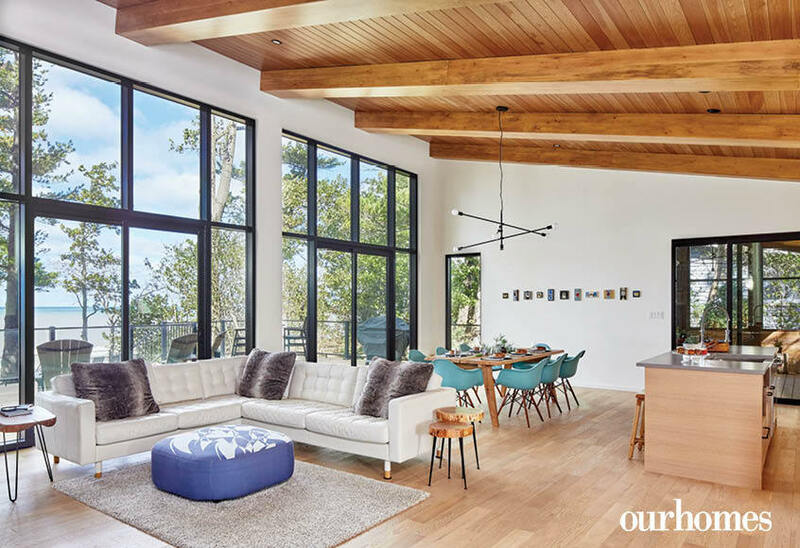 A wall of windows easily blends the interior and the expansive exterior deck into one vast indoor-outdoor living area for the family that enjoys entertaining friends and relatives regularly. Rod Nicholson of Nicholson Builders Inc. was the general contractor. His team did much of the interior finishing and trim, including the wood panelled ceilings with exposed interior rafters that continue to the exterior as rafter tails. Outside, a protected two-level stone patio carefully landscaped by Oasis Landscapes allows for easy entry on both levels of the cottage. Inside, a full wall of square-cut, random pattern Wiarton stone clads the fireplace (Safe Home Fireplace) and stands out for its rustic detailing. 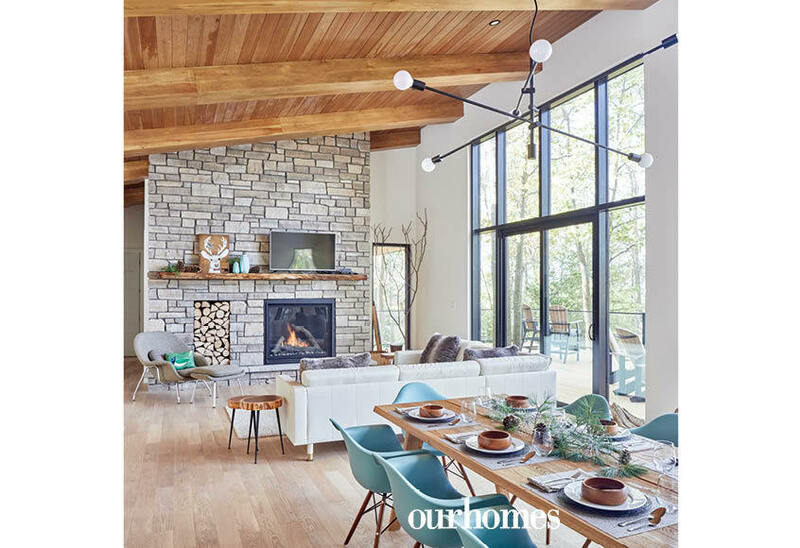 The rest of the great room, with a simple furniture grouping around the fireplace and a harvest table in the spacious dining area, creates minimal distraction from the lake and the woods. 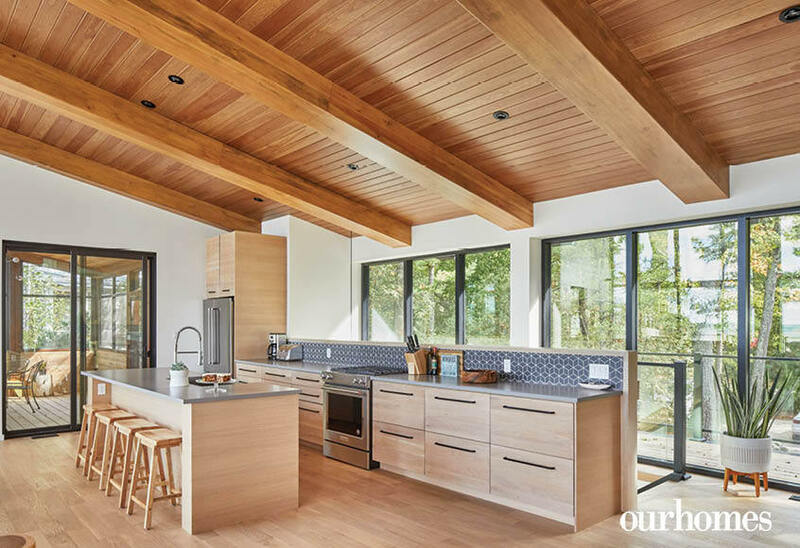 The contemporary kitchen reflects the cottage’s sleek, quiet vibe. 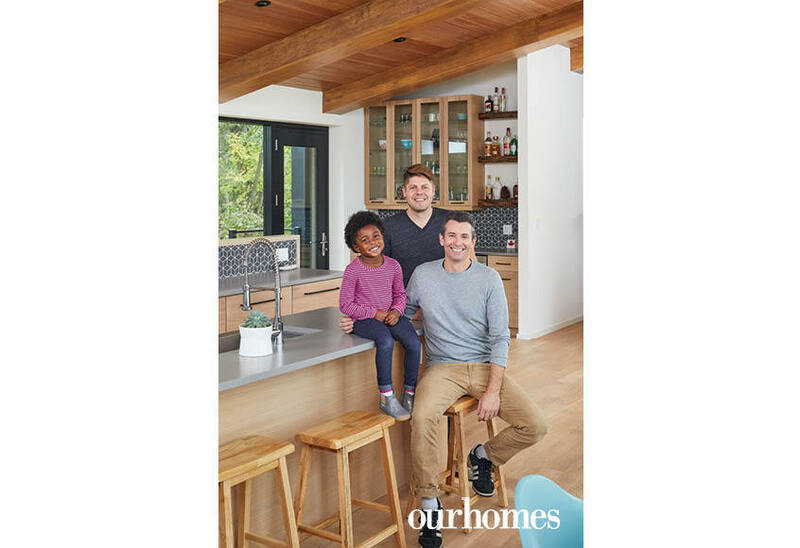 White oak cabinets in a simple natural finish (J&J Jones Custom Cabinets) are topped with soft grey quartz countertops. 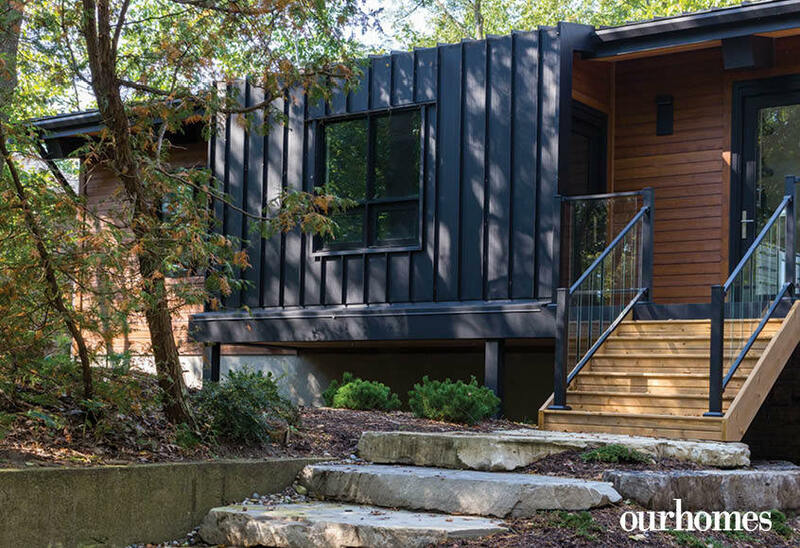 The siding on this Lake Huron cottage is Maibec stained Muskoka Brown. Black window frames and doors finished with nickel-plated hardware give an industrial embellishment. The mono-pitch, standing seam metal roof gets waterfall detail beside the entrance. Norah loves hanging out at the cottage with dads Jim and Jason. 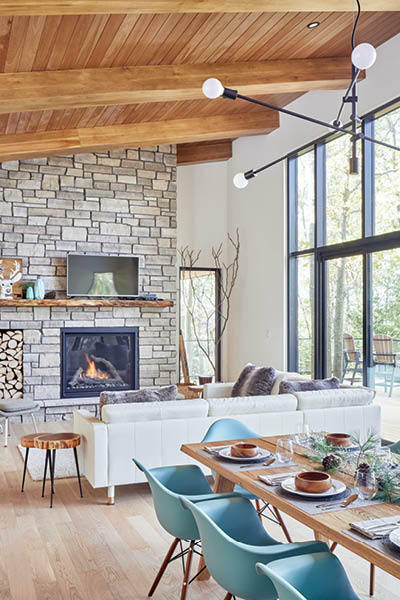 The great room features a floor-to-ceiling stone fireplace surround that doubles as a wall separating the living space from the bedroom wing. The vaulted ceiling is tongue-and-groove wood and exposed rafters stained Early American that continue through to the exterior. 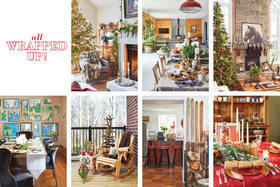 The idea of being inside yet feeling outside inspired the open-concept living space. A wall of windows showcases the view of the beach and Lake Huron. 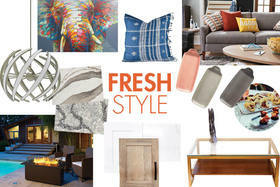 A white L-shaped sofa gets a playful blue fabric kid-friendly ottoman. A series of tiled images by wildlife and landscape artist Charley Harper coordinate with the robin’s-egg-blue Eiffel tower dining chairs and warm wood table in this cottage. 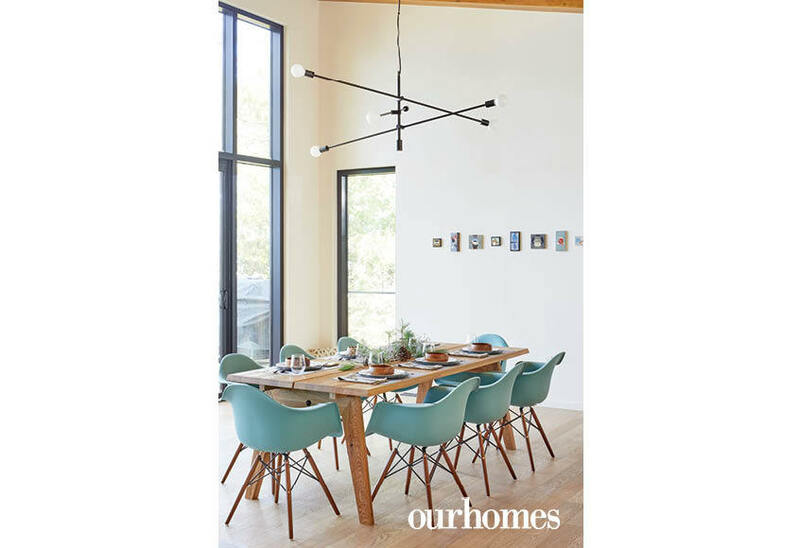 A large, yet simple, black, five-light chandelier hangs above. 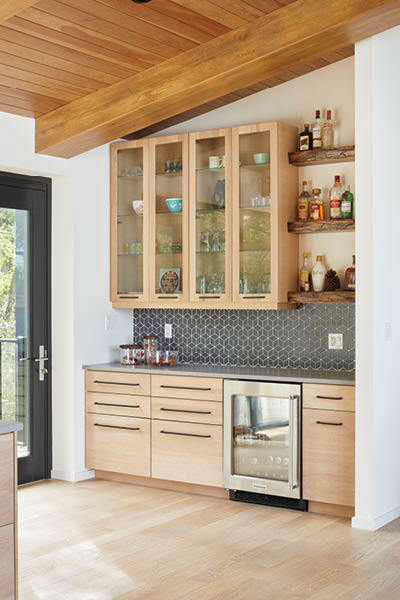 The honeycomb-style black tile in the kitchen is an eye-catching backsplash that offers a punch of pattern framed by the quiet and calm of simple design lines. Deep drawers tuck kitchenware and dinnerware away without the need for upper cabinets. The glass stairway to the lower level is tucked between the kitchen and the exterior wall. 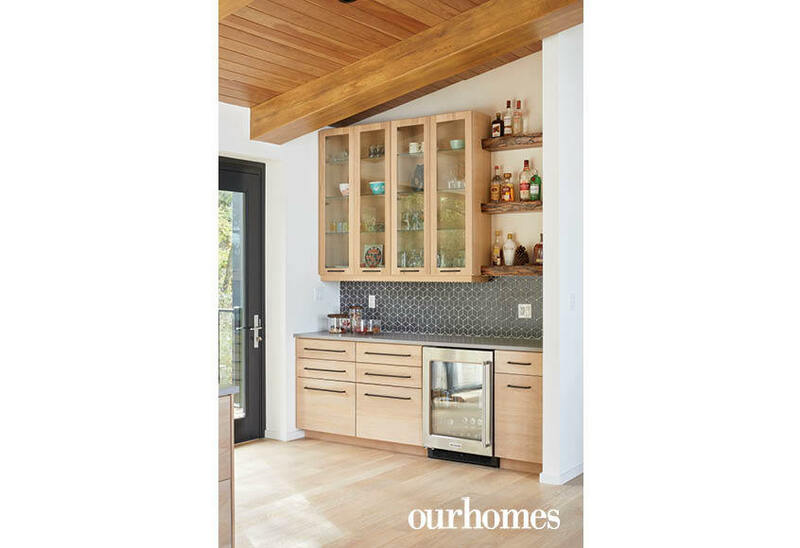 A spacious bar area also includes glass-fronted cabinetry for storing decorative pieces. 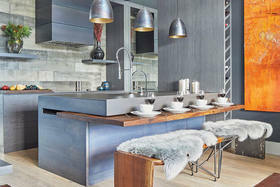 A grey, honeycomb-pattern backsplash introduces a geometric element. 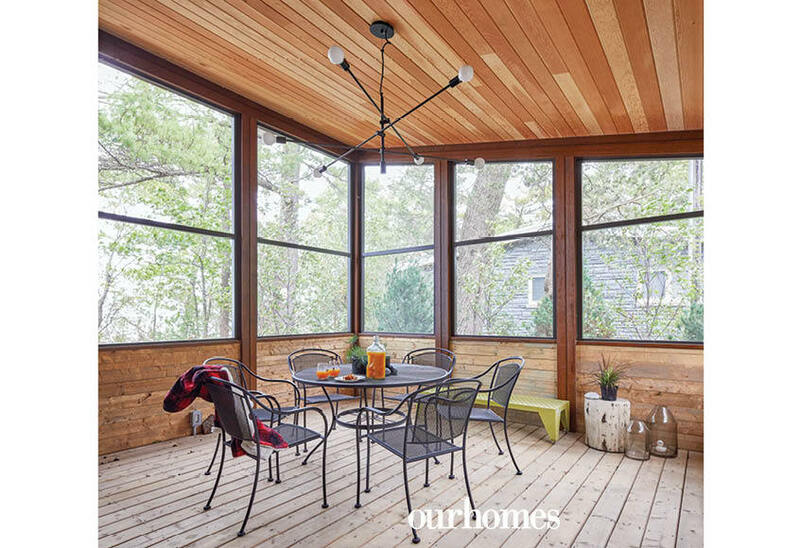 The large screened-in porch invites three-season dining and card-playing. 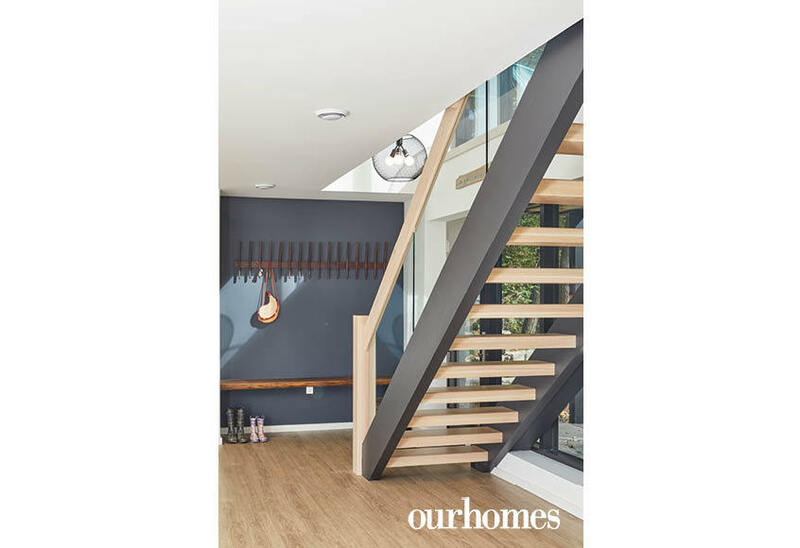 Plenty of glass plus the open wood and glass stairway ensure the lower level entryway is bright and airy. 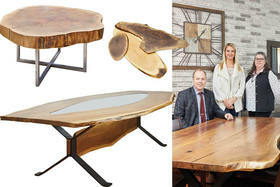 A dark feature wall has a live-edge bench and a row of hooks to gather the household’s coats and outerwear. Blues and greens accent the master bedroom and reflect Lake Huron’s ever-changing hues. 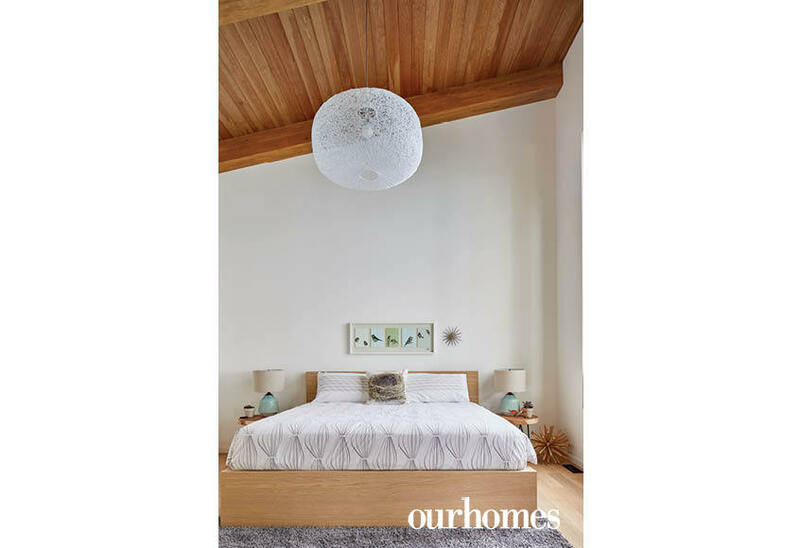 The platform bed has curvilinear bedding that reflects the lines in the large hanging pendant. A bird’s nest throw pillow looks as though it’s waiting for the avian art above the headboard to alight. 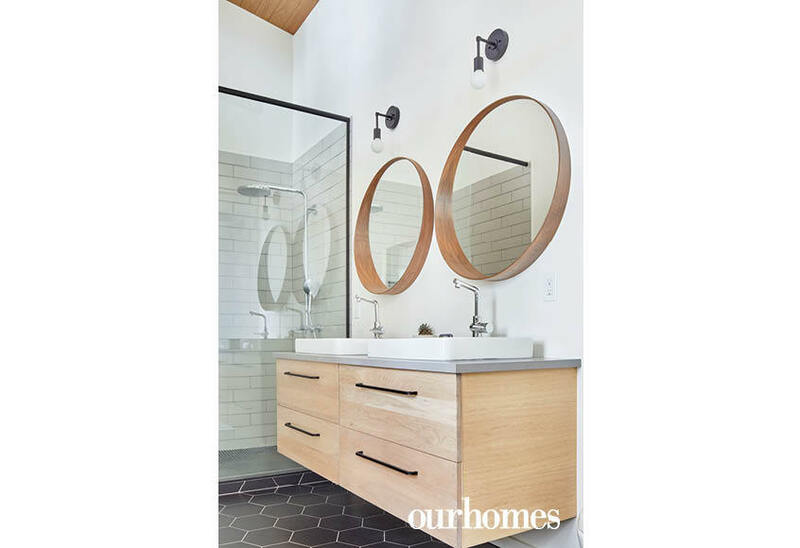 Pale wood finishes and soft grey shower tile pair with black accents and a bold hexagon tile floor in the master bathroom. A pair of round mirrors softens the lines. By situating the master bathroom on the inside of an exterior cottage wall, they were able to pop in a handy outdoor shower just off the master bedroom. Bird prints by Charley Harper add a colourful pop in the guest room. 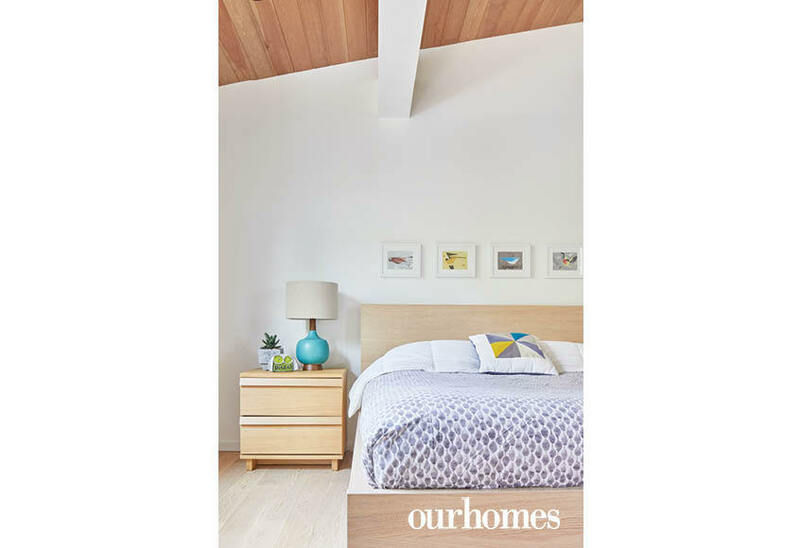 A platform bed in light-toned wood allows the turquoise lamp and purple geometric bedding to pop. The kids’ room, sensibly kitted with sturdy wood bunk beds, welcomes friends and cousins to the cottage. A blend of rustic and contemporary elements define the guest bathroom. A slice of a log becomes the backing for a circular mirror. 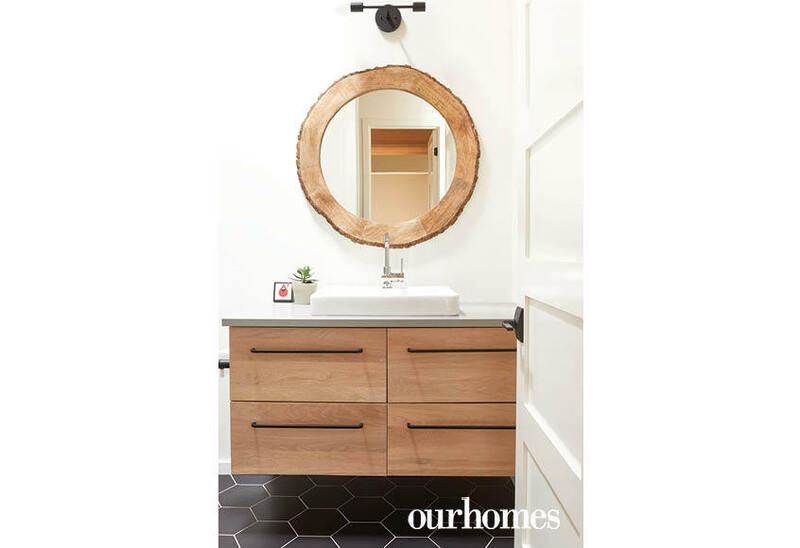 Hexagon tiles bring a geometric touch and a floating vanity with horizontal pulls keep things sleek. 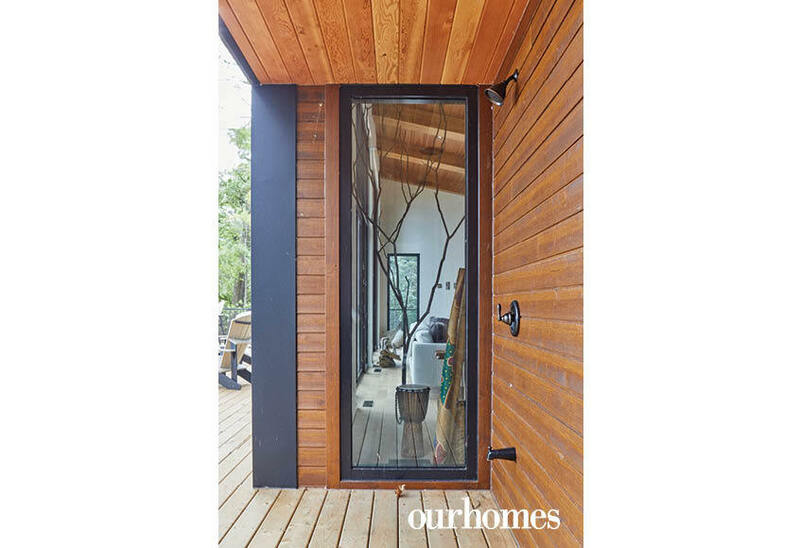 Custom interior doors throughout the cottage are seven-feet tall.